Edmund Halley – of Halley's Comet fame – noted the 'Chill and Damp which attended the Darkness' of an eclipse in 1715, causing 'some sense of Horror' among the spectators. Now we know why. The eerie eclipse weather experienced by Halley – and during last year's partial solar eclipse across the UK – was more than just a trick of the mind, scientists have confirmed. The 'eclipse wind' is a change in wind direction as the moon temporarily blocks out the sun, but up until now scientists have been baffled as to what causes it. Meteorologists at the University of Reading found the answer with help from an army of 4,500 citizen scientists around the UK, who took part in the National Eclipse Weather Experiment during the partial eclipse on 20 March 2015. Analysis of these observations, led by Dr Luke Barnard, revealed that not only did the atmosphere cool during the eclipse, the winds also slackened. To unravel the wind effects further experiment organiser Professor Giles Harrison and Professor Suzanne Gray examined the data from Met Office surface weather stations and a network of roadside weather sensors that monitor highway conditions. They found that the wind change is caused by variations to the 'boundary layer' – the area of air that usually separates high-level winds from those at the ground. Professor Harrison said: "There have been lots of theories about the eclipse wind over the years, but we think this is the most compelling explanation yet. "As the sun disappears behind the moon the ground suddenly cools, just like at sunset. This means warm air stops rising from the ground, causing a drop in wind speed and a shift in its direction, as the slowing of the air by the Earth's surface changes. "Our discovery was made possible thanks to data from the world's largest ever eclipse weather experiment combined with Met Office forecast data and measurement network observations. We thank the thousands of fellow scientists around the country whose measurements contributed to this research. "Halley also relied on combining eclipse observations from amateur investigators across Britain. We have continued his approach." These papers are published today (22 August) in a special 'eclipse meteorology' issue of the world's oldest scientific journal, Philosophical Transactions of the Royal Society A. The special issue is published 301 years after Halley's report of the eclipse in London in 1715 – and in exactly the same journal. The issue includes 16 new reports on eclipse meteorology from scientists at the Met Office, the Universities of Reading, Oxford, Sheffield and California Institute of Technology. The Director of the Science Museum, Ian Blatchford, also contributes a richly illustrated study of the depiction of eclipses in art. 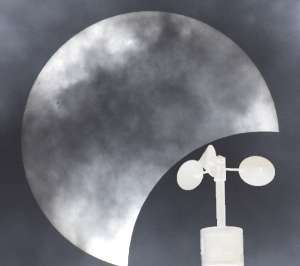 N. America treated to partial solar eclipse Thurs.